Hi there! What good thing(s) do you take for your health? 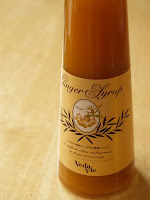 Last time when I went to the aromatherapy salon (caon), they introduced me a ginger syrup product called "Veda Vie Ginger Syrup". I tried it and I liked it but I wasn't that interested in it... However, later, when I picked up a beauty magazine at the GYM, I found the product is popular among models and actresses!!! Why don't I get one!? I ran back to the salon last Saturday to get one. haha! 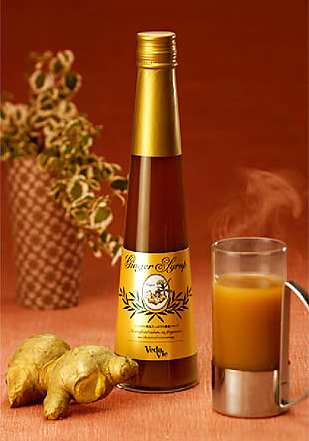 Ginger has warming effect, perspiration effect, fat-burning effect (8g-10g of ginger burns your fat! ), antioxidant effect, antidotal effect, and body purification effect. It eases up your disorders such as cold limb, shoulder stiffness, and back problem. 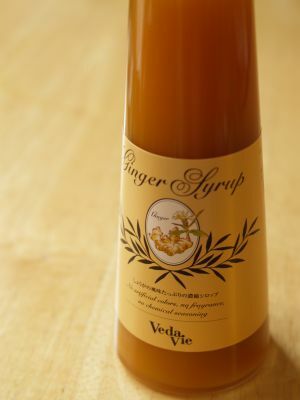 A bottle of Veda Vie Ginger Syrup contains 200g of ginger, so it's really thick! You can enjoy spicy-sweetness and feel it's working on your body! The drink is easy to make. You dilute the syrup with 6 to 8 times the amount of hot water, water, milk, tea, soda, or etc... I love to dilute it with hot water. Simple but luscious delicious!!! Also with plain yogurt or ice cream is my favorite. The temperature seems to go down from this afternoon. I have to be ready to wear my down jacket and keep warm!